Do you use and collect needle minders? 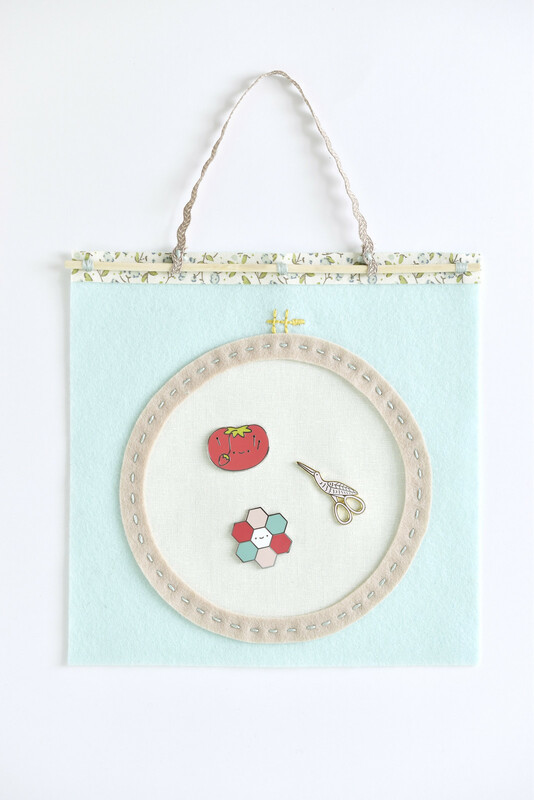 They're such a fun and useful embroidery accessory, and now you can store and display them on your wall! 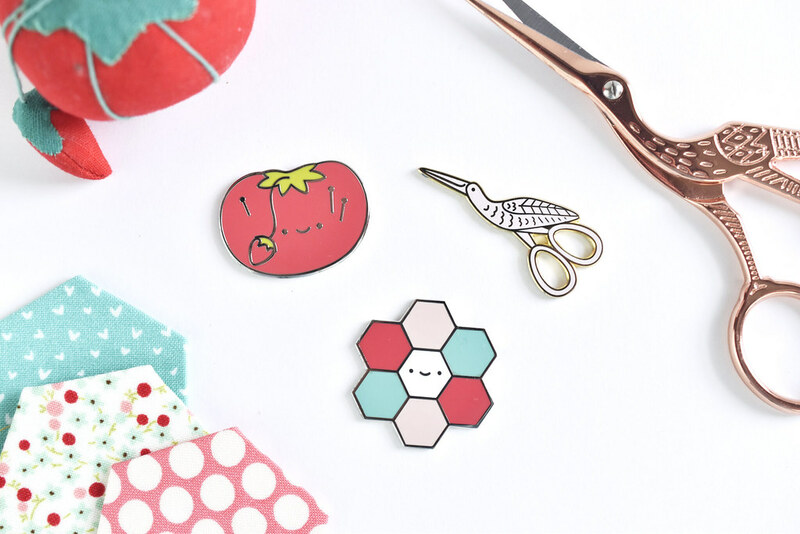 As I've designed enamel needle minders with Nicole at Cloud Craft, I've also had a growing stack of stitching and sewing items that like to stick to these magnets. What an ugly mess! So I decided it was time to make something to hold them, while showing off my favorites. This project was inspired by the banners and boards that people make to hold their enamel pin collections. I needed my own version! 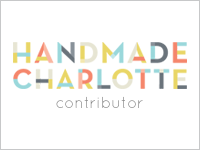 And so the needle minder minder was born! 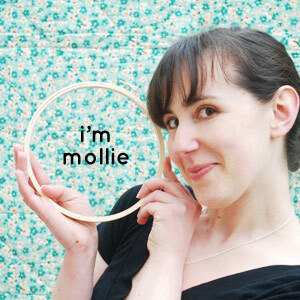 Since a needle minder goes on an embroidery hoop, I went with an embroidery hoop design. 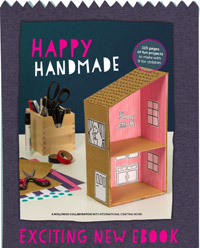 And to show off these pretty collaborations, Cloud Craft provided materials to make it. 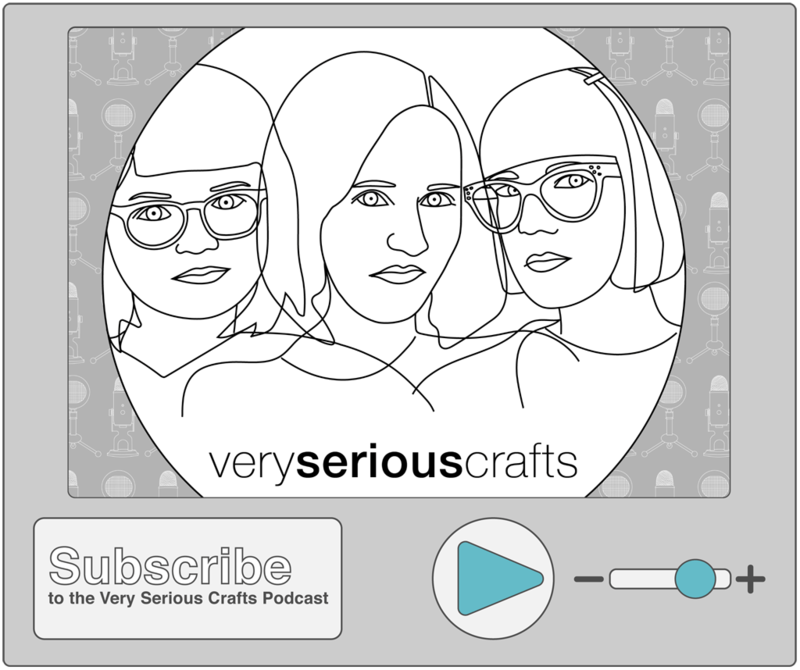 Oh, and maybe you've noticed that there's a new design on there? Yes? 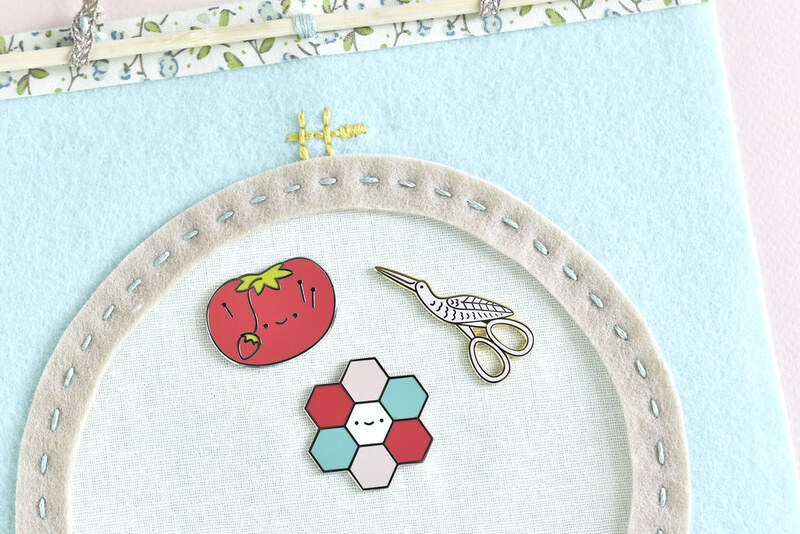 It's a brand new tomato pin cushion needle minder! Find all three of these at Cloud Craft (the newest one is coming very soon!). Note: Each of the links above will take you to Cloud Craft, where you can purchase the exact items that they provided for this project. 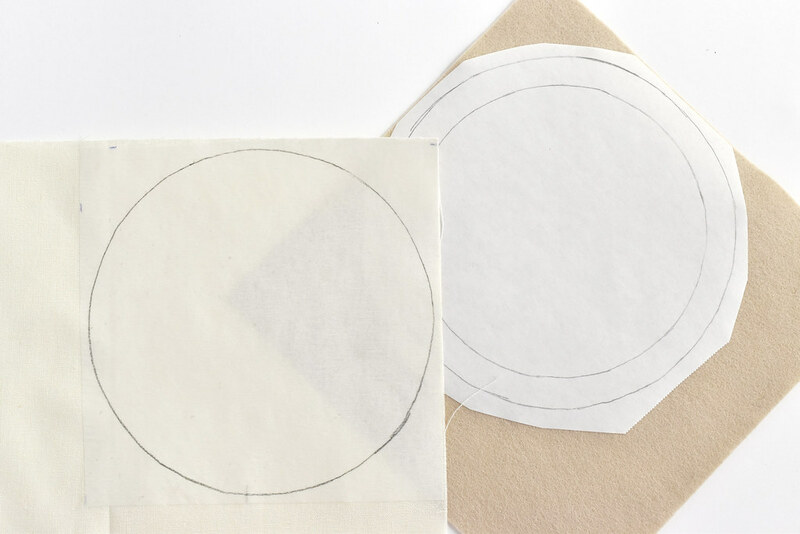 Trace the double circle template (page 1) onto the non-shiny side of the freezer paper and trace the single circle template (page 2) onto the paper side of the fusible web. Iron the freezer paper onto the Chai-colored felt and the fusible web onto the linen. Cut out the two circle pieces. 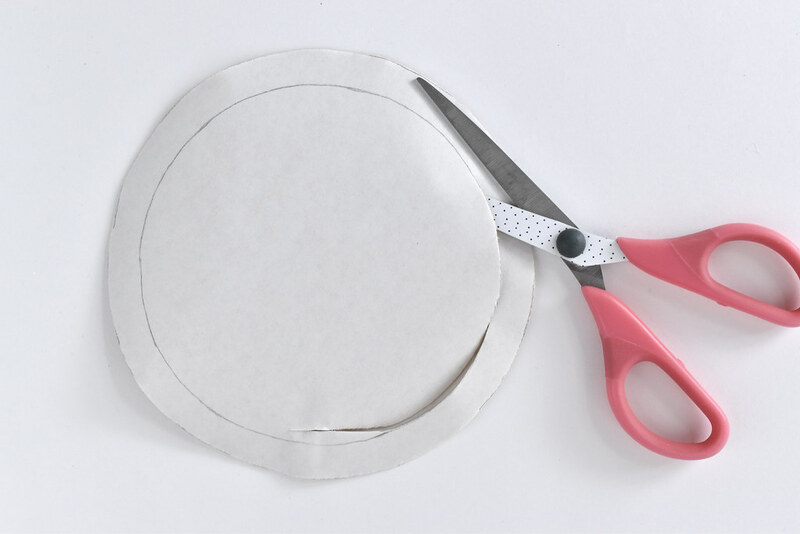 On the felt circle, cut out the center of the ring. I'm a big fan of "waste not, want not" so I carefully cut near the line to start, preserving as much of the middle as possible. 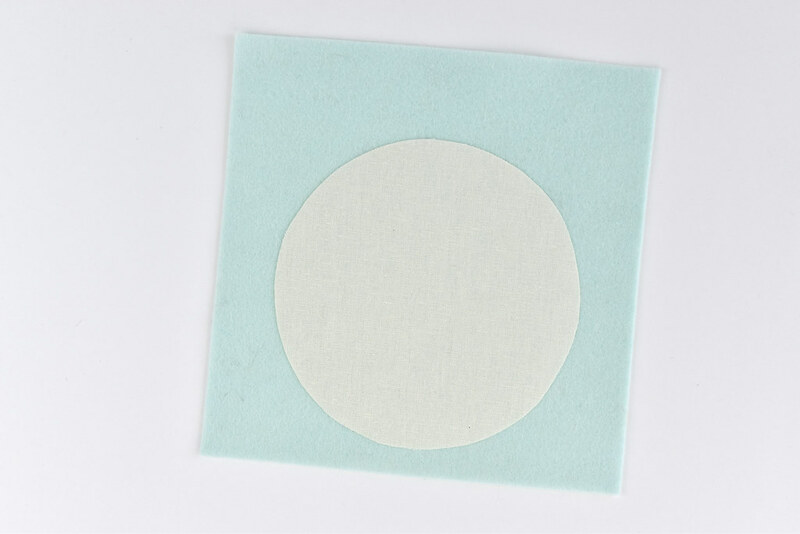 If you're using Cloud Craft felt, it comes as a 20x20cm square, which is the perfect size. If you're working with other felt, cut it to 20x20cm or about 8in square. 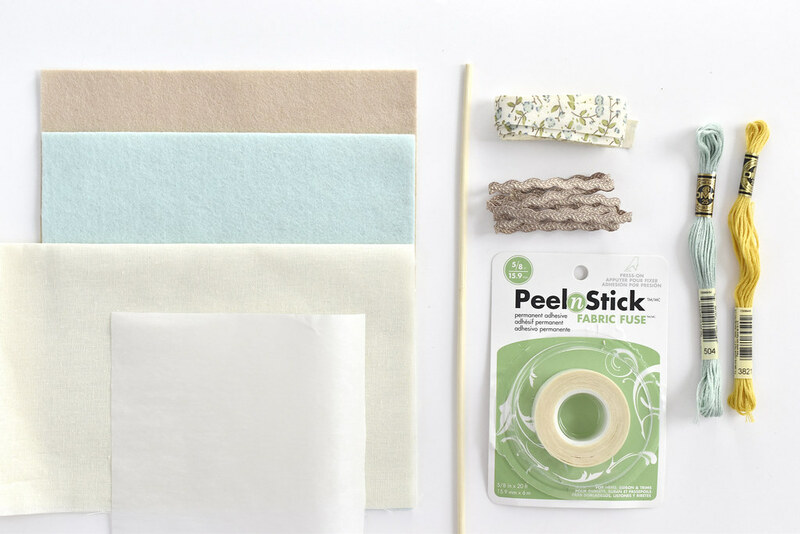 Peel the backing paper off the fusible web on the linen and iron the circle to the Spearmint-colored felt square. Place it near the bottom so there's extra room at the top. 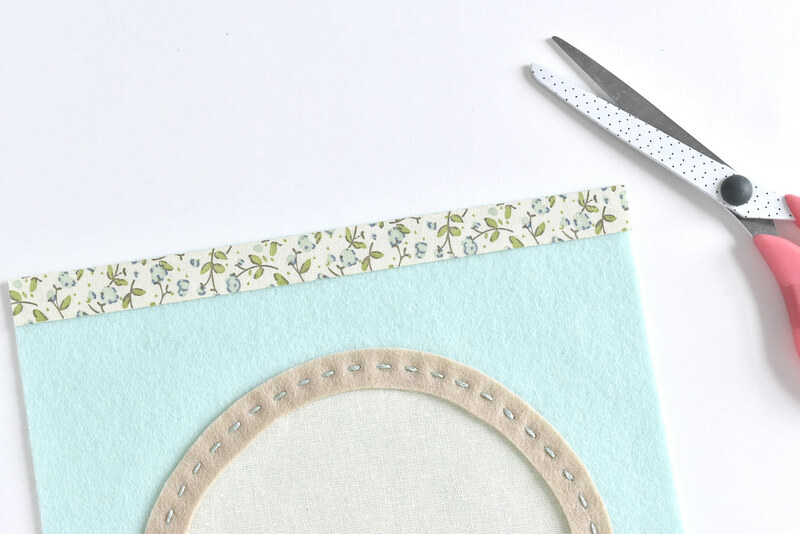 Peel the freezer paper off the felt ring and center it on the linen circle. 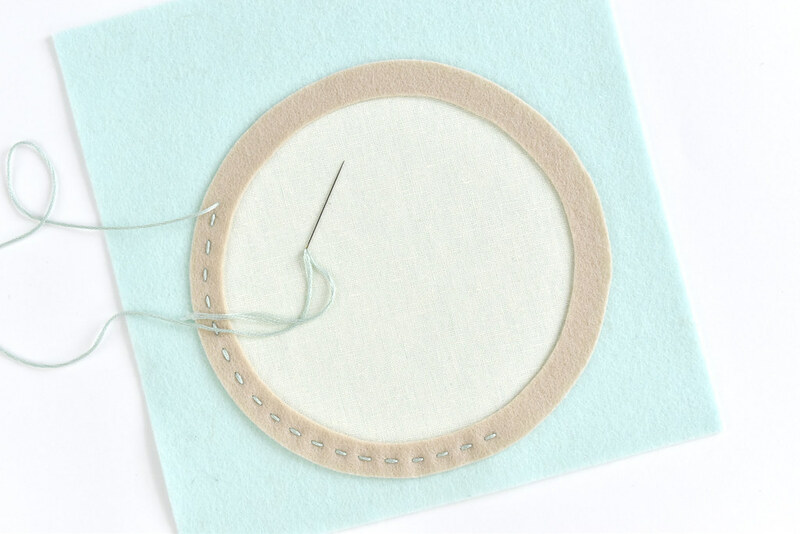 Stitch around the circle with running stitch and all six strands of embroidery floss. ...and trim the ends to make them even with the edge of the felt. Embroider the hardware at the top of the felt embroidery hoop. 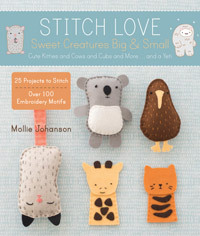 These lines are pretty simple, so you can freehand stitch them if you'd like, or use the pattern on page 2 of the PDF. 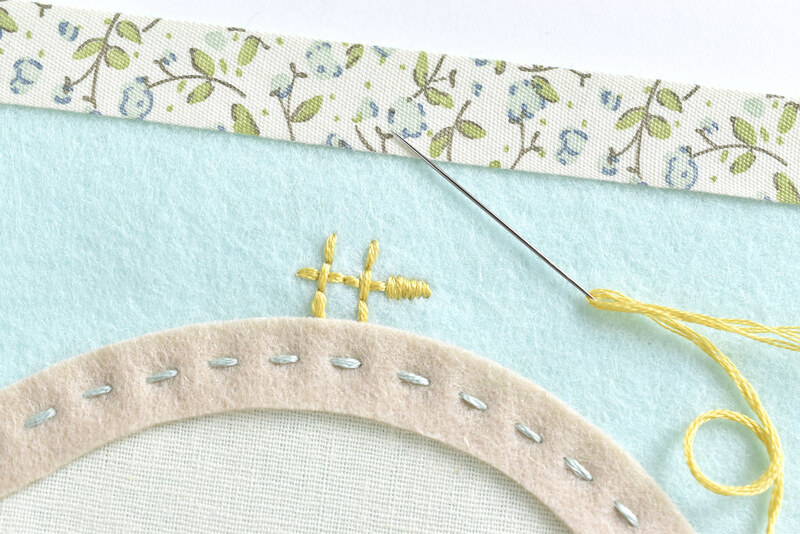 Use back stitch and satin stitch with all six strands of embroidery thread. 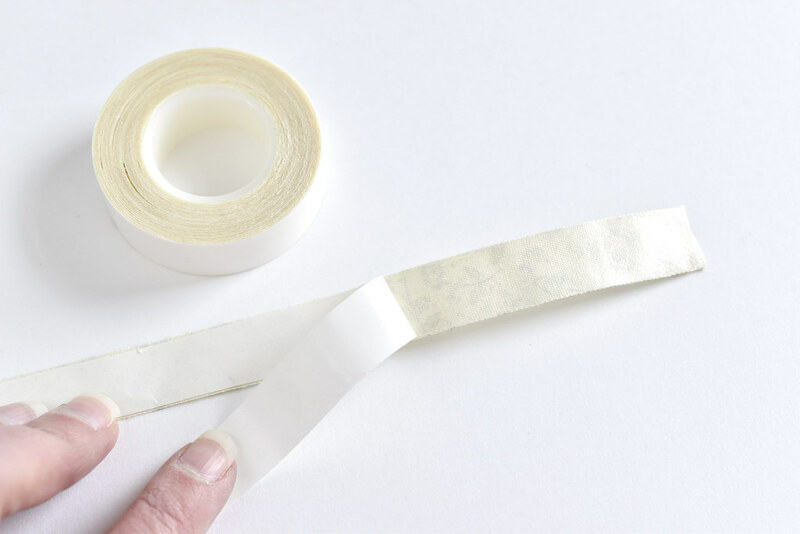 Cut the skewer or dowel to match the width of the banner. 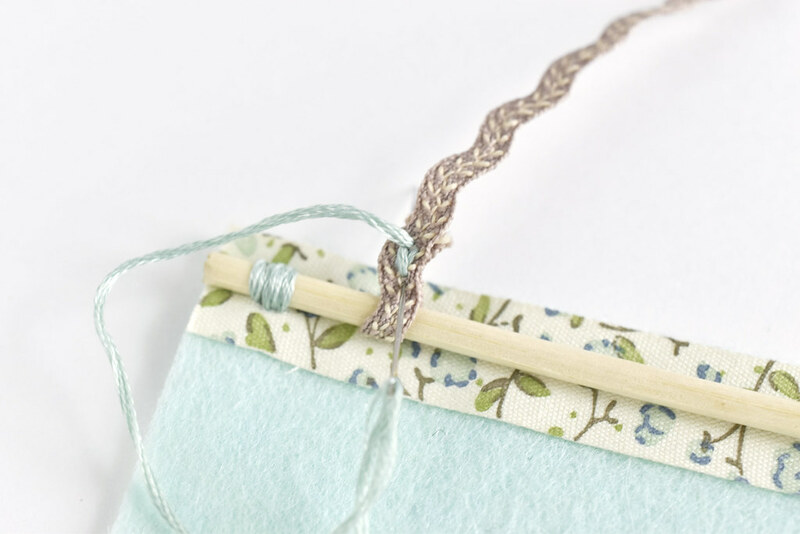 Hold it in place over the ribbon trim and stitch it with embroidery floss at the center and two ends. I should warn you, stitching through the adhesive tape made the needle gummy, but it wipes off. I'd imagine that using fusible web would be easier...but this still wasn't bad. Cut a 12-inch piece of ric rac trim and fold an end around the skewer near the end. Stitch it with a few straight stitches to secure it, then repeat at the other end. 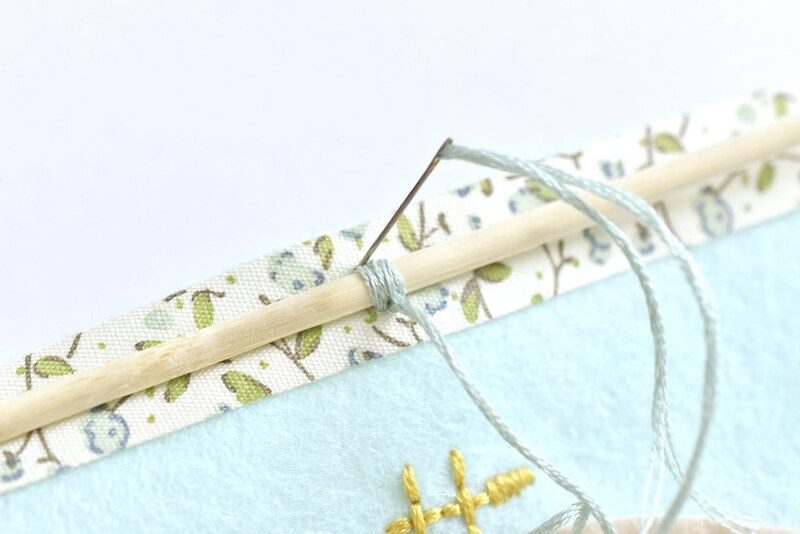 Now you can load up this needle minder minder with your favorite needle minders so you can find them easily and display them when they aren't attached to a project! I have a growing collection of needle minders, and I've made many of them. But these three are my favorites! 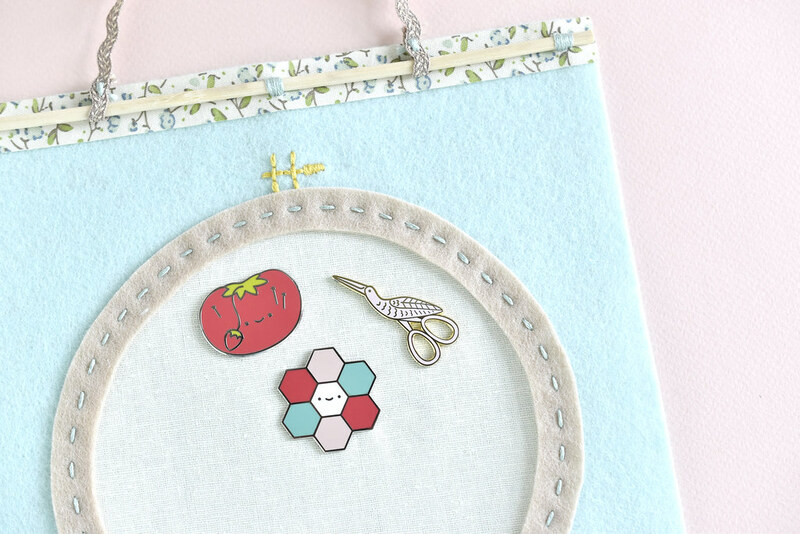 Even though my needle minders are frequently in use, sometimes they need a place to rest, and this is a much better (and prettier!) solution to a magnetic clump of safety pins, scissors, WonderClips and needle minders. I no longer have to pry things apart! So far, I haven't tested how much weight this banner will really hold, but I'd say we're safe with nearly filling the space. Besides, how many will you really have on there at once...we have too many projects going! What is this for? Sorry I'm confused lol. 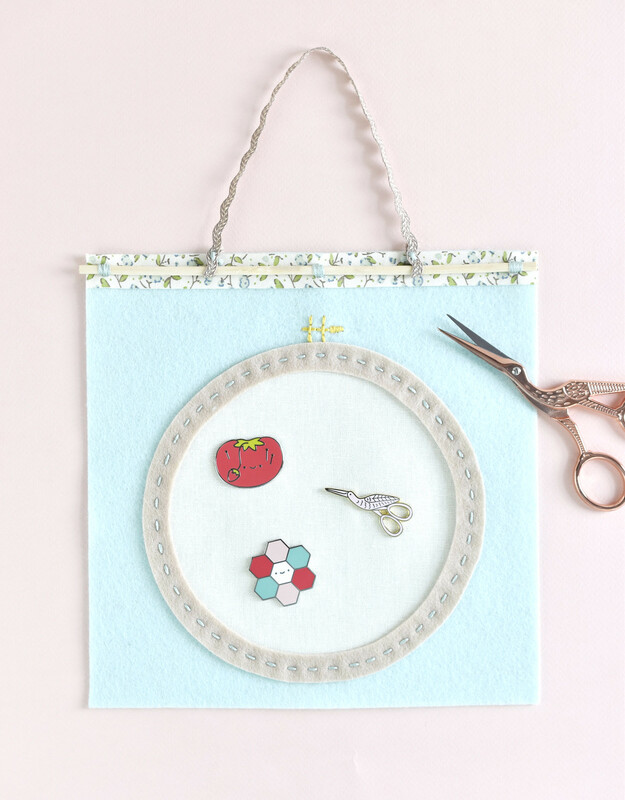 It's just a fun way to hold and display magnetic needle minders when they aren't in use. Otherwise mine usually end up in a giant clump. such a lovely idea for the pins!